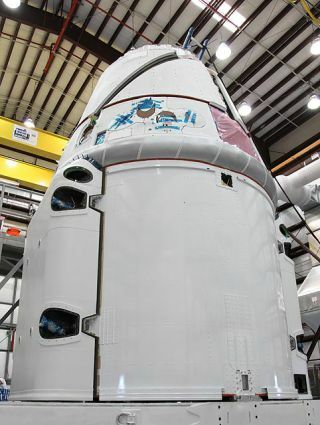 SpaceX tweeted on Jan. 4, 2012: "First look: Dragon Spacecraft in final processing, getting ready to head to the ISS." The launch of the first commercially built space capsule to the International Space Station will occur at the end of April, NASA officials announced today (March 15). California-based Space Exploration Technologies (SpaceX) is now aiming to launch its unmanned Dragon spacecraft on a demonstration flight to the orbiting outpost at 12:22 p.m. EDT (1622 GMT) on April 30, the agency confirmed today via Twitter. This test flight was originally slated to occur in early February, but the mission was delayed to allow extra time to test the spacecraft and its software. The Dragon capsule will launch atop SpaceX's own Falcon 9 rocket and, if successful, will be the first privately built spacecraft ever to rendezvous and dock with the International Space Station. The flight, which represents a crucial step forward for the commercial spaceflight industry, is designed to test the robotic spacecraft's ability to haul cargo to the orbiting complex. As the Dragon capsule approaches the station, astronauts onboard the outpost will grab onto it using the space station's robotic arm. The capsule will then be attached to the Earth-facing side of the station's Harmony node. This process is similar to how the unmanned Japanese cargo freighters are manually docked to the space station. The upcoming flight is the second for SpaceX under NASA's Commercial Orbital Transportation Services (COTS) program, which aims to foster the development of a new fleet of private cargo ships to deliver food, hardware and propellant to the space station. Dragon launched on its maiden flight in December 2010 in what was SpaceX's first test flight of the robotic vehicle. The spacecraft orbited Earth twice before splashing down in the Pacific Ocean. The successful test flight marked the first time a commercial company launched a vehicle into orbit and returned it safely to Earth. Under the COTS program, and as part of its partnership with NASA, SpaceX will receive up to $396 million for successfully completing the milestones outlined in their Space Act Agreement. SpaceX officials have said that the company eventually plans to use a version of the Dragon vehicle to carry astronauts and other paying customers to low-Earth orbit.